About us What our customers say Offers & promotions Contact us Nursery & Reception Primary Secondary & Further Ed. Public Spaces Commercial Where do I start? Magical's primary portfolio is second to none. Children of school age demand a stimulating, fun and exciting environment. By linking our playground markings to the curriculum, outdoor learning is fun as well as educational. The outdoor classroom is a must and immensely versatile in all weathers. A story telling area creates an enchanting and creative space in which to listen and read. 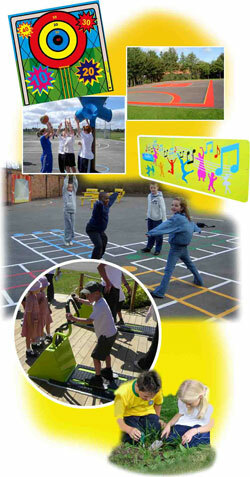 Sports and social areas can be zoned to specification. We are confident you will be pleasantly surprised at the multitude of products available.